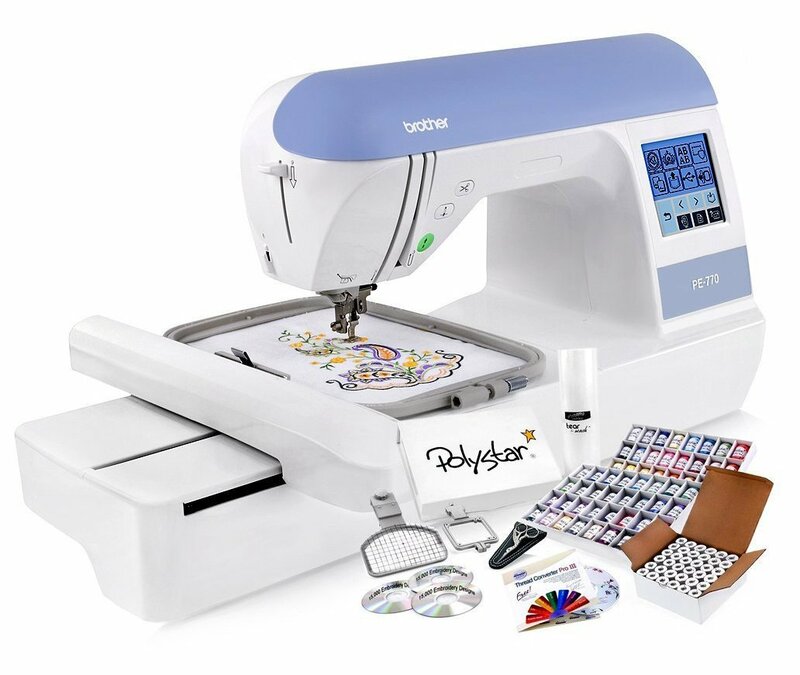 Step up to the sophisticated but surprisingly easy to use computerized Brother PE770 (PE 770) Embroidery Machine. Containing features such as a USB Flash Drive Port, touchable LCD screen and 5″ by 7″ embroidery space. The USB Flash Drive Port allows you the ability to store thousands of embroidery designs on a USB Flash Drive! No matter what your project may be, let the revolutionary Brother PE-770 open the door to a whole new world of possibilities. The PE-770 has a generous 5″ x 7″ embroidery field allowing you to embroider many designs available on the market with ease. Enjoy embroidering pillows, blankets, shirts and more! Even at the PE-770’s amazingly high speed of 650 stitches per minute, you will experience crisp and precise embroidery. A conveniently located Function Panel is located right in front of the user, allowing easy access to the Programmed Thread Trimming Button, Needle Up/Down Button and Start/Stop Button. When installing a bobbin in the Brother PE-770 Embroidery Machine simply drop in a full bobbin, thread in the direction of the arrow and you are ready to sew. The PE-770 has 136 built-in embroidery designs and 6 Built-In Fonts, so you can start embroidering right out of the box. With the Brother PE-770 Embroidery Machine you can position your design wherever you like, rotate your design, reflect your design and increase the size the size of your design right on the Brother PE-770 Embroidery Machine’s LCD Touch Screen. The Brother PE-770 also has On-Screen, Step-by-Step Instructions in case you ever need help. Grand Slam Embroidery Package Included!!! Hit a true Grand Slam with this Amazing Package! The Brother PE-770 Grand Slam Embroidery Package, includes Polystar 64 Count of Embroidery Thread w/ Thread Box, 15,000 Embroidery Designs CD, Prewound Bobbins, Thread Converter Pro III, Stabilizer, Cap Hoop, Sock Hoop and Stork Embroidery Scissors!